On Aug. 9, the Vermont Division for the Blind and Visually Impaired (DBVI) recently held a picnic and recreation day at Emerald Lake State Park in Dorset. Vermont is home to some of the country’s greatest scenery and adventure sports and Vermont Adaptive Ski and Sports makes every day count for people of all abilities. The non-profit organization serves a unique community and offers a variety of sports statewide for participants with disabilities. Adaptive sports programming in the summer and fall months include cycling, indoor rock climbing at Petra Cliffs in Burlington, therapeutic horseback riding at MoonRise Farm in Taftsville, paddling in various areas of Rutland, Washington and Chittenden Counties as well as points south and in the Waterbury/Montpelier area, sailing and paddling on Lake Champlain and cycling on the bike path in Burlington. 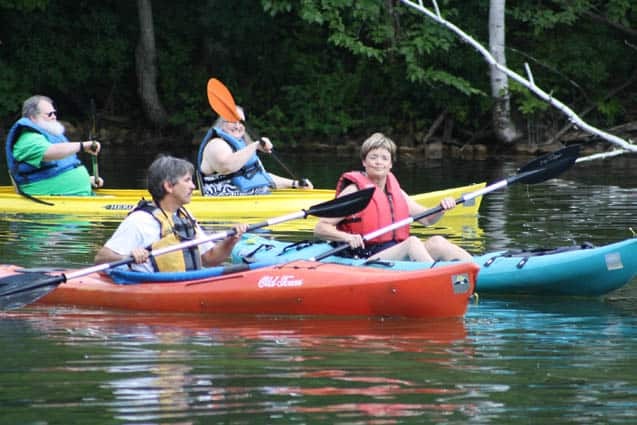 Vermont Adaptive also offers custom group outings by request in several different locations that involve activities like beeper baseball, hiking, wellness programs, environmental curriculum, tennis, and more. Vermont Adaptive hosts annual fundraisers to raise money for programming and expensive adaptive equipment. Their largest fundraiser is the Long Trail Century Ride, a benefit ride with multiple distances and routes, which raised more than $200,000 this year alone and hosted approximately 1,000 people at the après-ride party at Long Trail Brewery at Bridgewater Corners. Vermont Adaptive was a beneficiary this year to events such as the Vermont Sports Medicine Center 5K in Rutland, and the Vermont 100 Endurance Race in Windsor. This past Saturday, Aug. 22, Vermont Adaptive also benefited from funds raised at the third annual Bolton Valley 5K at Bolton Valley Ski Area. Other upcoming benefit events this fall include The Vermont 50 Mountain Bike/Ultra Run, Sept. 27 in the Mount Ascutney area, and the Allen Clark Memorial Hill Climb on Oct. 4 in the Mad River Valley near Sugarbush Resort. In addition to raise the funds for programming and equipment, these events also help to promote disability awareness, while bringing the whole Vermont community together to achieve a common goal. Through generous support of the community, Vermont Adaptive Ski and Sports has grown to be the nationally recognized nonprofit organization it is today. Killington/Pico Resorts, Sugarbush Resort and Bolton Valley Ski Area have all allowed Vermont Adaptive to make a winter home at their bases. Recently, Killington Resort allowed Vermont Adaptive and the Pico Ski Education to build the Andrea Mead Lawrence Lodge at Pico Mountain providing a space for the Vermont Adaptive’s state headquarters and home-base for winter programming at Pico and Killington as well as summer programming throughout southern Vermont. Vermont Adaptive also recently partnered with the Vermont Department of Tourism and Marketing and Vermont State Parks Department of Forests, Parks and Recreation to bring InclusiveVermont.com, a website that helps visitors find accessible outdoor recreation and amenities statewide. They also assist in helping Vermont Adaptive bring summer programming and events to The Vermont Division for the Blind and Visually Impaired (DBVI) by providing accessible venues for weekend outings throughout the summer, most recently there was a DBVI picnic and recreation day at Emerald Lake State Park in Dorset, Aug. 9. In the Burlington area, Vermont Adaptive teams up with Local Motion, which helps promote cycling on the Burlington Bike Path and assists Vermont Adaptive with bike loans. Petra Cliffs, also in Burlington, has worked with Vermont Adaptive for more than 10 years to bring year-round indoor rock climbing to groups and military service people of all disabilities and injuries, including individuals with amputations, paraplegia and visual impairments. Vermont Adaptive also partners with Green Mountain Rock Climbing Center in Rutland for indoor rock climbing. “Rock climbing is really beneficial to our clients, especially in a group setting where they can also work on team building,” said Tom Alcorn, senior program coordinator at Vermont Adaptive Ski and Sports. In southern Vermont, Vermont Adaptive partners with MoonRise Farm in Taftsville for therapeutic horseback riding, which provides horseback riding to individuals with developmental disabilities, paraplegia and groups like Zack’s Place in Woodstock. They play games to increase coordination, as well as groom and feed the horses to help facilitate emotional growth. Vermont Adaptive also has a strong relationship with Spaulding Rehabilitation Center in Boston to support patients recovering from spinal cord injury and paraplegia, including some who have professionally competed in the U.S. Paralympics in Park City, Utah.